Assumptions are the variant of verbal reasoning questions asked to check the efficiency of decision making skills of the candidate. 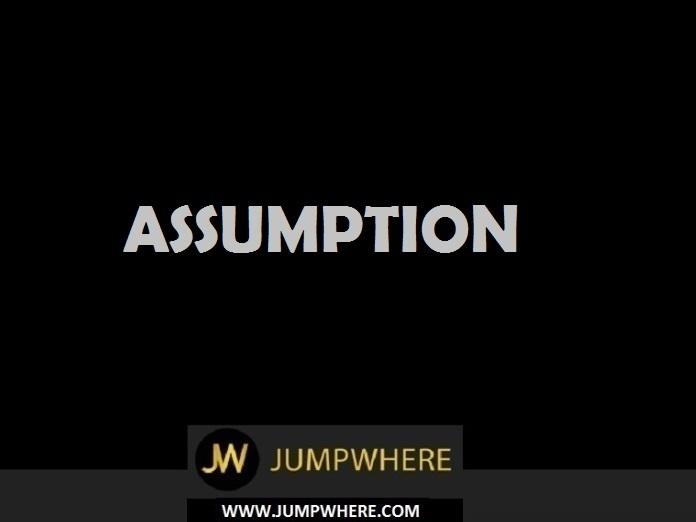 A typical question involves stating a statement which is followed by 2 or more assumptions and we are supposed to answer which assumption follows. These are the questions that either make you or break you. ‘Make you’ because they don’t require calculations, charts etc. and can be answered in just a glance, if done with mastery. (E) If both I and II are implicit. Congratulations - you have completed Assumptions - Question and Answers. Shalini made an application to the bank for a loan of Rs. 1,80,000 by mortgaging her house to the bank and promised to repay it within five years. I) The bank has a practice of granting loans for Rs. 1,00,000 and above. II) The bank accepts house as collateral security against such loans. The fact that Shalini has applied for a loan of Rs. 1,80,000 implies that the bank can grant a loan above Rs. 1,00,000. So, I is implicit. II also follows directly from the statement and so is implicit. "X-chocolate is ideal as a gift for someone you love. "â€" An advertisement"
I) People generally give gifts to loved ones. II) Such advertisements generally influence people. III) Chocolate can be considered as a gift item. The X-Airlines has decided to increase the passenger fare by 15 percent with immediate effect. I) The demand for seats of X-Airlines may remain unchanged even after the hike of fare. II) Other airline companies may also hike the passenger fares. Clearly, such decisions are taken only after making sure that it will not affect the company's business adversely. So, I is implicit. However, the impact of this increase on other airlines cannot be ascertained. So, II is not implicit. Quality of life of a person is not dependent only on his wealth. I) The aim of most people is just to acquire more wealth. II) There are some factors other than wealth which contribute to the quality of life. III) Wealth does not contribute to the quality of life at all. Clearly, I does not follow from the statement. So, it is not implicit. The statement mentions that quality of life does not depend only on wealth. This means that there are some other factors as well, which govern the quality of life. But this does not imply that wealth does not contribute at all. So, II is implicit while III is not. In the recently held All India Commerce Conference the session on 'Management of Service Sector in India' surprisingly attracted large number of participants and also received a very good media coverage in the leading newspapers. I) People were not expecting such an encouraging response for service sector. II) Service sector is not managed properly in India. III) Media is always very positive towards service sector. Since the response was 'surprising', so I is implicit. Nothing about the real management of service sector can be deduced from the statement. So, II is not implicit. Also, the statement talks of the media's response to only a particular session on service sector and not all in general. So, III is also not implicit. To make the company commercially viable, there is an urgent need to prune the staff strength and borrow money from the financial institutions." â€” Opinion of a consultant. I) The financial institutions lend money for such proposals. II) The product of the company has a potential market. III) The employees of the company are inefficient. Since the consultant talks of borrowing money from financial institutions, so I is implicit. That the owners wish to make the company 'commercially viable' makes II implicit. Also, it is mentioned that staff strength is to be reduced to make the company 'commercially viable'. The school authority decided to open a summer school this year in the school compound for the students in the age range of 7 - 14 years. I) All the students will attend the summer school. II) All the parents will prefer to remain in the city than going out of town for enabling their children to attend the summer school. III) Those who cannot afford to go out of station will send their children to summer school. The statement talks of the policy of opening a summer school. But the response of the children and their parents cannot be deduced from it. To improve the employment situation in Jndia, there is a need to recast the present educational system towards implementation of scientific discoveries in daily life. I) The students after completing such education may be able to earn their livelihood. II) This may bring meaning of education in the minds of the youth. III) The state may earn more revenue as more and more people will engage themselves in self-employment. Television X - the neighbour's envy, the owner's pride "â€" A T.V. advertisement. I) Catchy slogans appeal to people. II) People are envious of their neighbours' superior possessions. III) People want to be envied by their neighbours. Clearly, both I and II directly follow from the statement. Also, it is clear that people wish to buy a thing which they can be proud of. So, III is not implicit. "Join X-tuition classes for sure success. Excellent teaching by excellent teachers is our strength. "â€" An advertisement"
I) Sure success is desirable. II) Students expect sure success when they join any tuition class. III) Just having excellent teachers does not ensure success. The advertisement seeks to attract the students by promising them sure success. So, both I and II are implicit. Assumption III does not follow from the statement and so is not implicit. "We do not want you to see our product on newspaper, visit our shop to get a full view." â€” An advertisement. I) People generally decide to purchase any product after seeing the name in the advertisement. II) Uncommon appeal may attract the customers. III) People may come to see the product. It can be inferred from the statement that people also like to see a product before buying. So, I is not implicit. Also, the statement is just an attempt to arouse the people to come and see the shop. So, both II and III are implicit. Lack of stimulation in the first four or five years of life can have adverse consequences. I) A great part of the development of observed intelligence occurs in the earliest years of life. II) 50 percent of the measurable intelligence at age of 17 is already predictable by the age of four. The lacking in first four or five years can be adverse because it is the main period of development. So, I is implicit. Since nothing is mentioned about the predictability of intelligence, II is not implicit. The government has decided to pay compensation to the tune of Rs. 1 lakh to the family members of those who are killed in railway accidents. I) The government has enough funds to meet the expenses due to compensation. II) There may be reduction in incidents of railway accidents in near future. Clearly, the amount of compensation must have been decided keeping in mind the monetary position of the Government. So, I is implicit. However, nothing can be said about the frequency of railway accidents in future. So, II is not implicit. Films have become indispensable for the entertainment of people. I) Films are the only media of entertainment. 'Films are indispensable' does not mean that they are the only means of entertainment. So, I is not implicit. Clearly, II follows from the statement. So, it is implicit. Of all the newspapers published in Mumbai, readership of the "Times" is the largest in the Metropolis. I) 'Times' is not popular in mofussil areas. II) 'Times' has the popular feature of cartoons on burning social and political issues. Neither the volume of readership of the 'Times' in areas other than the Metropolis nor the reason for its huge acclamation is evident from the statement . So, neither I nor II is implicit. The Government has decided to levy 2 percent on the tax amount payable for funding drought relief programmes. I) The Government does not have sufficient money to fund drought relief programmes. II) The amount collected by way of surcharge may be adequate to fund these drought relief programmes. Since a surcharge has been levied to fund drought relief programmes, it follows that the Government does not have sufficient money for the same. So, I is implicit. Besides, the percentage of surcharge must have been decided after studying the expected inflow in relation to amount of funds required. So, II is also implicit. Never before such a lucid book was available on the topic. I) Some other books were available on this topic. II) You can write lucid books on very few topics. It follows from the statement that books on this topic were available before also but they were not 'lucid'. So, I is implicit. But a general comment as II cannot be made from the given statement. Please do not use lift while going down - an instruction on the top floor of a five-storey building. I) While going down, the lift is unable to carry any load. II) Provision of lift is a matter of facility and not of right. The statement requests people not to use lift while moving down. This implies that the lift may be used to move up and the request has been made so that more people can use the lift for ascending which would otherwise cause more physical stress than going down the stairs. So, only II is implicit. Statement: "I have not received telephone bills for nine months inspite of several complaints" - A telephone customer's letter to the editor of a daily. I) Every customer has a right to get bills regularly from the telephone company. II) The customer's complaints point to defect in the services which are expected to be corrected. The customer's eagerness to get the bills makes I implicit. Besides, the customer has written to the editor to bring the malfunctioning of the department to public notice. "This drink can be had either as it is, or after adding ice to it." - An advertisement. I) People differ in their preferences. II) Some people will get attracted to the drink as it can be had as it is. The advertisement tells the different ways in which the drink can be had. This means that different people prefer to have it in a different way and that some people would prefer it only because it can be taken in a particular manner. So, both I and II are implicit. Government has permitted unaided colleges to increase their fees. I) Unaided colleges are in financial difficulties. II) Aided colleges do not need to increase fees. Unaided colleges have been allowed to increase their fees. This means that they are in financial difficulties. So, I is implicit. Nothing is mentioned about the aided colleges. Be humble even after being victorious. I) Many people are humble after being victorious. II) Generally people are not humble. Clearly, nothing is mentioned about the nature of the people. So, I is not implicit. Also, the statement gives an advice of being humble even after being victorious. This means that generally people are not humble. So, II is implicit. The university authority has decided to decentralize conduct of terminal examinations and give this responsibility to each college for its students to avoid delay in declaration of results. I) The colleges are equipped to carry out this responsibility. II) There may not be uniformity in evaluation Standard across the colleges. III) The students may welcome this new development. The university must have taken this decision keeping in mind the efficiency of the colleges. So, I is implicit. II is vague and is not implicit. The statement mentions that the new policy would help avoid delay in declaration of results. So, III is also implicit. The successful man has the ability to judge himself correctly. I) Inability to judge correctly causes failure. II) To judge others is of no use to a successful man. III) The successful man cannot make a wrong judgement. Assumptions I and III directly follow from the statement and so both are implicit. Also, the basic quality of a successful man is that he can judge himself. This means that he need not judge others. So, II is also implicit. Use X brand shoes. These are durable and available in all sizes. An advertisement in the newspaper A.
I) Normally people like durable shoes. II) Very few people read advertisement in a newspaper. III) Very few people read the newspaper A. Any advertisement highlights only the desirable qualities of the product. So, I is implicit. The 'X' brand has advertised its product in newspaper A. This implies that a large section of people reads advertisements in newspapers and that newspaper A too has a wide circulation. So, neither If nor III is implicit. I want to present a book on techniques of yoga to Ajay on his birthday. "â€” A tells B.
I) A will be invited by Ajay on his birthday. II) The person to whom the book is to be presented, is not keeping good health. III) Book is an acceptable gift for birthday. Since A has decided to gift a book to Ajay on his birthday, it is quite evident that he will be invited by Ajay and that a book is an acceptable gift. So, both I and III are implicit. Nothing about the state of health of the person can be deduced from the statement. "Wanted a two bedroom flat in the court area for immediate possession. "â€" An advertisement." I) Flats are available in court area. II) Some people will respond to the advertisement. III) It is a practice to give such an advertisement. The advertisement depicts only the requirement, not the availability of flats in court area. So, I is not implicit. Such advertisements are given with the expectation of a response which can make such a flat available. So, II is implicit. Assumption III does not follow from the statement and so is not implicit. Keeping in view the financial constraints, the management institution has decided to charge at the time of providing employment in various organizations, a placement fee of Rs. 25000 from the organizations in which the student will be provided the employment. I) It will help in increasing the demand of the students belonging to the management institution. II) The amount collected in this way will be purposeful. III) It may be possible that the organization providing employment may select less number of students in future. Since the management has imposed a fee of Rs. 25000 for the employment of each student by the organisation, so III is implicit while I is not. Since the statement mentions that the fee is being charged to cover up the financial constraint, so II is implicit. Give this packet to Mr. X at his residence and return immediately. In case you are likely to be late inform me Mr. A tells his clerk. I) The clerk never informs about his late coming. II) The clerk may not obey Mr. A's instructions. III) The clerk may not inform his late coming unless instructed. Clearly, the statement is merely a reminder. So, I is not implicit. Besides, the clerk is expected to execute his boss' order. So, II is not implicit. Also, a hunch that the clerk may not inform about his late coming has led Mr. A to instruct the clerk to do so. Wars must be discouraged vehemently even though majority of the victims might have been a nuisance to peace loving people. I) Wars kill majority of wicked people. II) Innocent people are also killed in wars. III) Vehement opposition to wars may have some desirable impact. The statement mentions that.....majority of the victims might have been a nuisance to peace loving people. This implies that majority of the victims are wicked people though some victims are innocent people too. Both I and II are implicit. Further, the statement advocates vehement opposition of wars.